A gloriously grand design, the Kensington Wooden Stool Beige Velvet will deliver a sense of majesty to your bar area or kitchen worktop. With exquisite details for contemporary opulence, the Kensington Wooden Stool radiates a sense of splendor. 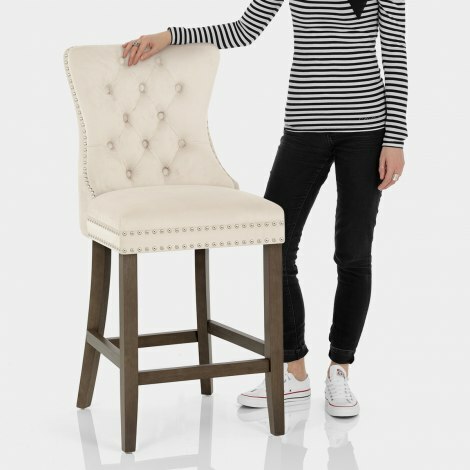 Offering dining chair-like comfort at bar height, the beige velvet seat is belted and unites with a tall supportive backrest. Sparkling chrome studs add a modern boutique appeal. They edge the seat pad and the shapely backrest, which also features classic quilted buttons and a magnificent chrome ring on the rear. Complementing the seat are four dark wood finished legs, which gently taper to the ground and set the seat at the perfect height for kitchen counters. A strong bracing bar footrest and protective underside plugs are practical additions to the elegant Kensington. "Chairs are first class. Really rich looking"
The bar stools appeared well built and look stylish. Easy to assemble and comfortable height with soft texture and complimented our kitchen design. Chairs are first class. Really rich looking. We have been looking these type of stools for a long time. Looks even better than in pictures. A must buy. Absolutely delighted with stools. Look lovely in my kitchen. Very good quality stool. Looks amazing and really comfortable. I would recommend this product to anyone.